In 2018, aggregate global growth and inflation matched forecasters expectations, but portfolio returns fell far short of what was expected a year ago. At that time, the consensus forecast for global growth was the most optimistic in years and central banks were expected to continue on the path of unwinding monetary stimulus. The expectation among global strategists was for positive single-digit equity returns and weak bond market returns, consistent with consensus views that strong, synchronized global growth, Trump's tax cuts, and central bank withdrawal of stimulus would support equity returns while depressing bond returns. That is not what happened! 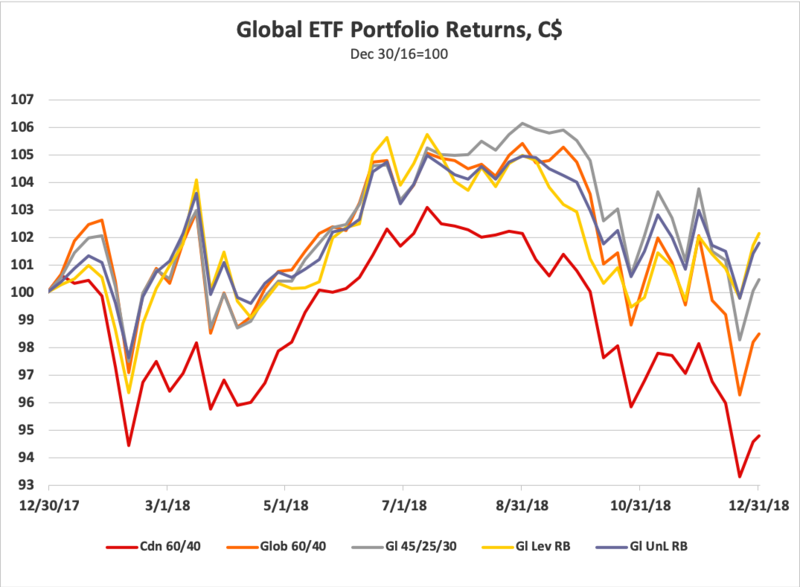 Since we began monitoring our Global ETF portfolios at the end of 2011, we have found that the global portfolios we monitor have all vastly outperformed a simple all-Canada 60/40 portfolio. this proved true once again in 2018. A stay-at-home Canadian investor who invested 60% of their funds in a Canadian stock ETF (XIU), 30% in a Canadian bond ETF (XBB), and 10% in a Canadian real return bond ETF (XRB) had a 2018 total return (including reinvested dividend and interest payments) of -5.2% in Canadian dollars. This virtually wiped out the all-Canada portfolio gain of 2017. All of our global ETF portfolios outperformed the all-Canadian portfolio in 2018. 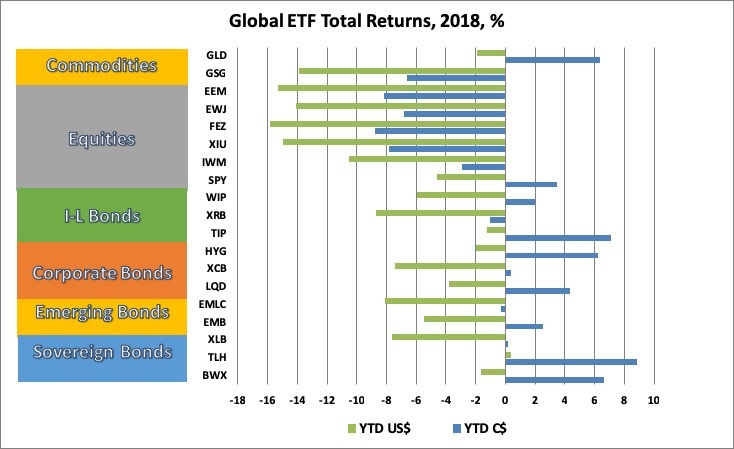 In 2018, with the CAD depreciating almost 8% against USD, over 4% against the JPY and relatively unchanged against the Euro, the best global ETF returns for Canadian investors were in US government bonds and gold. The worst returns were in Eurozone, Emerging Market and Canadian equities. The chart below shows 2018 returns, including reinvested dividends, for the ETFs tracked in this blog. The returns are shown in USD terms (green bars) and in CAD terms (blue bars). Only one of the 19 Global ETFs that we track posted a positive USD total return in 2018. That was TLH, the Long-term (10-20yr) US Treasury Bond ETF, which returned +0.4% if monthly distributions were reinvested. In CAD terms, returns on unhedged foreign currency ETFs were boosted by the depreciation of the Canadian dollar. The best gains were in the Long-term US Treasury Bond (TLH) which returned 8.8% in CAD terms and the US Treasury Inflation Protected Bonds (TIP) which returned 7.1%. Other gainers in CAD terms were the Non-US Government Bonds (BWX), the Gold (GLD), the US High Yield Corporate Bond (HYG), the US Investment Grade Corporate Bond (LQD). The only equity ETF to make a positive return in CAD terms was the S&P500 (SPY) which returned 3.5%. Small positive returns were also made in the USD Emerging Market Bond (EMB), the World Inflation Protected Bond (WIP), the Canadian Corporate Bond (XCB) and the Canadian Long Bond (XLB). The worst performers in CAD terms were the Eurozone Equity ETF (FEZ) which returned -8.7%, the Emerging Market Equity (EEM) -8.1%, and the Canadian Equity (XIU) -7.8%. Other losers were the Japanese Equity (EWJ), the Commodity ETF (GSG), and the US Small Cap Equity (IWM). 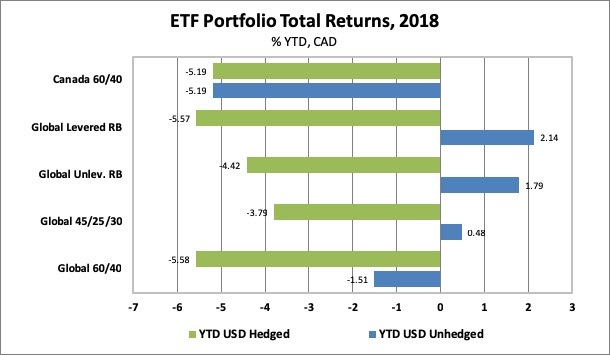 In 2018, the global ETF portfolios tracked in this blog posted mixed returns in CAD terms when USD currency exposure was left unhedged, but negative returns when USD exposure was hedged. In a November 2014 post we explained why we prefer to leave USD currency exposure unhedged in our ETF portfolios. A simple Canada only 60% equity/40% Bond Portfolio returned -5.2%, as mentioned at the top of this post. Among the global ETF portfolios that we track, the Global 60% Equity/40% Bond ETF Portfolio (including both Canadian and global equity and bond ETFs) returned -1.5% in CAD terms when USD exposure was left unhedged, and -5.6% if the USD exposure was hedged. A less volatile portfolio for cautious investors, the Global 45/25/30, comprised of 45% global equities, 25% government and corporate bonds and 30% cash, gained 0.5% if unhedged, but had a negative return of -3.8% if USD hedged. Risk balanced portfolios outperformed in 2018 if left unhedged, but performed poorly if USD exposure was hedged. A Global Levered Risk Balanced (RB) Portfolio, which uses leverage to balance the expected risk contribution from the Global Market ETFs, gained 2.1% in CAD terms if USD-unhedged, but lost 5.6% if USD-hedged. An Unlevered Global Risk Balanced (RB) Portfolio, which has less exposure to government bonds, inflation-linked bonds and commodities but more exposure to corporate credit, returned 1.8% if USD-unhedged, but lost 4.4% if USD-hedged. In my view, there were four key economic and policy developments that left a mark on portfolio returns in 2018. The first was the interaction of the fiscal stimulus provided by President Trump's tax cuts and Federal Reserve's determination to normalize US monetary policy. The second was Trump's aggressive approach to trade policy, first in NAFTA negotiations and then in tariffs targeting China. The third was the increasing divergence between stronger than expected US growth and weaker than expected growth outside the US. The fourth was the Government of Canada's mismanagement of regulatory policies governing the building of pipelines to provide access for Canadian oil to world markets. After a promising January, both bond and equity markets stumbled badly in February as an uptick in US wage growth prompted markets to price in more aggressive tightening by the Fed. At the same time, Trump threatened to pull out of NAFTA unless Canada and Mexico got serious about accepting US negotiating demands. As the wage uptick proved temporary and NAFTA negotiations resumed, Trump implemented steel and aluminum tariffs and began the process of ratcheting up tariffs on China. In the summer, Trump threatened to impose 25% tariffs on vehicles produced in Canada and Mexico, if they wouldn't agree with his NAFTA demands. Through this period, Emerging Market equities and currencies fell sharply. As global growth stumbled in 3Q, with both the Eurozone and Japan posting real GDP declines, weakness in equity markets spread to Europe, Japan and Canada. Slowing global growth, including in China, weakened commodity prices. Crude oil prices fell on slowing global demand and booming US supply. Canadian oil prices tanked, as the rising Canadian oilsands production was shut in by inadequate pipeline capacity. As risk markets sold off, volatility rose, and inflation plateaued, both the Fed and the Bank of Canada continued to signal steady withdrawal of monetary stimulus. Meanwhile, as the Republicans lost control of the House of Representatives, Trump continued to ratchet up tariff pressure on China, hoping to force a deal. The impact on portfolio returns is clearly shown in the above chart. All portfolios stumbled in February-March, but recovered through the spring into mid-summer. Both US and Canadian equity equity markets managed to put in record highs as bond yields rose. The combination of slowing global growth, rising US-China trade frictions and central banks apparent unconcern about market volatility, proved a trifecta that led to the the sharp 4Q equity market correction and a muted bond market rally. When the Fed tightened for the fourth time of the year in December and Chairman Powell suggested that Fed balance sheet reduction was on auto pilot, it only added to the huge selloff in US and global equities in December. Only then did Fed officials begin to signal some flexibility on the monetary policy. But by this time, the damage to risk markets was done. From their August highs in the +5 to 6% range, year-to-date returns for Canadian investors in Global ETF portfolios shrank to the -2 to +2% range in the final four months of the year. The All Canada Portfolio return sank from +3% in mid-July to -5% by yearend. As we enter 2019, two crucial questions face markets. The first is whether "The Great Unwind" of unconventional monetary policy that began in mid-2017 will proceed as signaled by the FOMC or whether faltering momentum in the global economy will force central banks to pause indefinitely or even reverse course. The second is whether the US-China trade dispute will lead to a face-saving ceasefire or to an all-out trade war. The two issues are inter-related. Withdrawal of stimulus by the Fed spills over into tighter global financial conditions, pressuring China's highly leveraged economy. Trade tensions and tariff hikes weaken global growth and add to coast pressures, a toxic mix for equity markets. While the consensus outlook expects slowing but still solid global growth in 2019, markets do not currently share most economists view of a "soft landing" and central banks withdraw stimulus. The best hopes for stronger portfolio performance for Canadian investors in 2019 would be a US-China trade truce, a Fed that pauses and reasserts "data dependence" as key for additional monetary policy normalization, and a U-turn in Canadian government policy toward resource development and transportation. If these hopes materialize, 2019 could be a very good year for investors. If not, the last four months of 2018 will likely prove to be just the beginning of a sustained bear market in risk assets.